Inside the Honor Band Z1 box you will find welcoming sentence, “Just try it”. Boomshakalaka. This is the Honor Band Z1, which is a budget smartwatch that will retail for $79 in the U.S. Inside the box, there’s another box that contains extra wristband holder and rope style USB charger. This is actually an upgrade from the Huawei Watch charger, cool. On the front, you will find a circular, metal trim with a 128 x 128 pixel resolution LCD. On the back, you will find charging ports that are compatible across Huawei’s Android Wear smartwatches. Yes, I can charge my Huawei watch with Band Z1’s charger. I think this is particularly good idea since chargers are compatible across all Huawei devices. 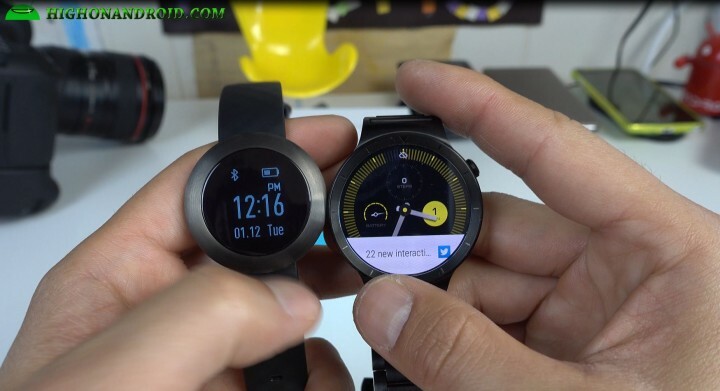 Although Band Z1 does not run Android Wear, the operation is awfully similar to it as you can swipe down, up, left, and right to get things done. You can wake the watch by tapping on it or flicking your wrist. Swiping down will give you number of steps, followed by calories burned, followed by hours of sleep, and comes with a timer that will calculate number of steps and calories burned for tracking your walks or runs. The watch also does come with several different watch faces to choose from. Pairing is easy with both Android and iHos, you can download Huawei Wear app to pair and check in detail your steps and sleeping patterns. I really dig the sleep tracking feature as I know how much deep sleep I got last night plus light sleep. I know, I slept a ton last night but I am still recovering from CES. You can also get notifications from your favorite apps, simply choose the apps you want to receive notifications on your watch. Okay, so why Band Z1? With so many awesome new Android Wear smartwatches coming out, you may still be on the fence about spending a few hundred bucks on a watch that may be outdated in 6 months. The Band Z1 doesn’t have zillions of apps like Android Wear but for casual user who wants basic features like notifications from your favorite apps, step tracking, and most importantly if you want sleep tracking. After trying this Band Z1, it’s not a bad device at all. It’s not the perfect device out there but if you are looking for a budget-friendly device that does basic features of smartwatch at an affordable price along with excellent sleep tracking, this could be a good buy. Lastly but not least, the Band Z1 boasts 4 days of battery life which means you don’t have to charge it daily like most smartwatches. The Honor Band Z1 isn’t out yet in the U.S. but it should retail for $79 when it comes out so definitely check it if it interests you. Next story Huawei Mate 8 vs Galaxy Note 5 Camera Comparison! Previous story T-Mobile Binge On Throttles! & How To Turn Off Binge On!